To use emoji on an iPhone, all you need to do is activate the built-in emojis keyboard in your iOS operating system. 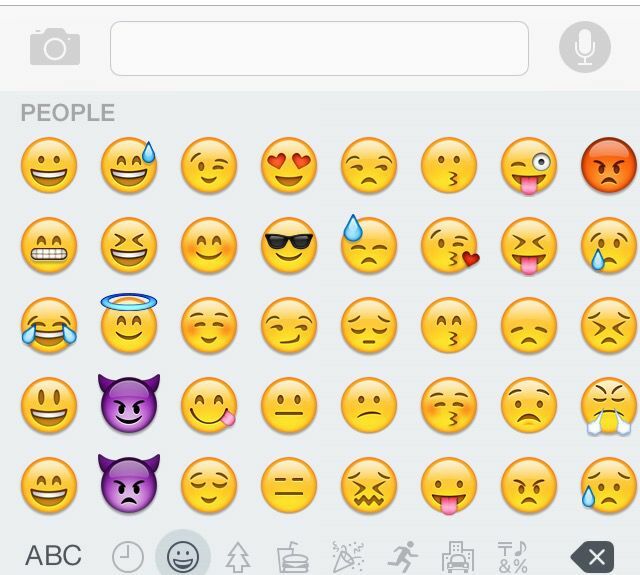 Apple has made emoji keyboards available for free on all iPhones since it rolled out the iOS 5.0 operating system. Once activated, the built-in emoji keyboard appears at the bottom of your smartphone screen where the regular keyboard appears when you’re composing messages—only instead of letters, the emoji keyboard shows rows of those little cartoon-like pictures known as “emoji” or smiley faces. To activate your emoji keys, go to the “General” sub-category under your “Settings” menu. Scroll three-quarters of the way to the bottom and tap on “keyboard” to see your keyboard settings. Look for “add new keyboard” and tap that. It should now show you a list of available keyboards in a variety of language. Scroll down past the Ds and “Dutch” and look for the one labeled “Emoji”. Yes, Apple considers “emoji” a type of language and lists it along with all the others! Tap on “Emoji” and it will install the picture keyboard and make it available to you whenever you are typing anything. To access the emoji keyboard after it’s been activated, call up your regular keyboard and look for a tiny globe icon at the bottom, below all the letters, right next to the microphone icon. Tapping the globe brings up the emoji keyboard in place of the regular keyboard letters. Swipe right to continue seeing additional groupings of emoji. Simply tap on any image to select it and insert it into your message or post. When you want to return to your regular keyboard, just tap the tiny globe again, and it will whisk you back to the alpha-numerical keyboard. You may be wondering what emoji are and how they differ from, say, emoticons. Emoji are picture characters. The word itself is derived from Japanese that refers to a graphic symbol used to represent a concept or idea. They’re similar to emoticons, only broader because they don’t just express emotions like smileys and other emoticons do. Emoji is a linguistic mashup that literally comes from the Japanese words for “picture” and “characters.” Emojis got their start in Japan and are wildly popular in Japanese mobile messaging platforms; they have since spread worldwide and are used in a variety of social media apps and communication systems. Many of the emoji images have been adopted into the global computer text-coding standard known as Unicode. The Unicode Consortium, the group that maintains the Unicode standard, adopted a whole new set of emoticons as part of an updated Unicode standard in 2014. You can see examples of popular emoticons at the EmojiTracker website. If you want to do more than simply insert an emoji sticker or emoticon image into your message, there are tons of free and inexpensive apps that allow you to be more creative. Emoji apps for the iPhone typically provide a visual keyboard that shows the little pictures or emoticons known as emoji. The pictorial keyboard lets you tap on any image to insert it into any text message you might send and into posts in a variety of social media apps, too. Emoji Keyboard 2: This free emoji app offers animated emoticons and stickers that jiggle and dance, along with tools for creating your own emoji art. It works with messages created for Facebook, Twitter, Whatsapp, Instagram, Google Hangouts and more. Emoji Emoticons Pro: This app costs 99 cents to download and it's worth it. The app provides an emoticon keyboard that lets you tap to insert a variety of emoji stickers, word art with emoji, and special text effects into your SMS text messages as well as into your updates to Facebook and tweets on Twitter. It will create all kinds of art with emoji images if you want.